Ray Reilly has built upon his golden triangle, unveiling stage two of three at the landmark Sydney Park Hotel, bringing a new suite of boutique accommodation into his harem. Irish-born Reilly bought the Sydney Park Hotel mid-2016, not long after selling his long-held Trinity Bar, citing need for a “new passion”, strengthening his presence in the area, alongside his popular Henson Hotel in Marrickville. 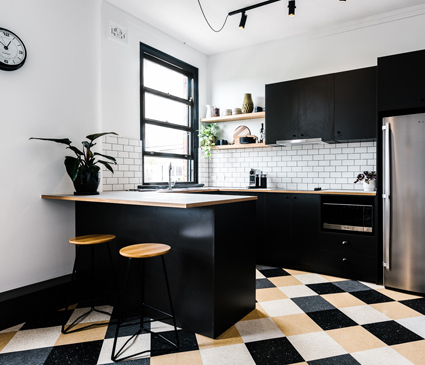 Almost a year later, he took the inner-west trifecta with purchase of Goodtime Hospitality’s West Village, which Reilly said he would return to its former moniker of Petersham’s White Cockatoo. 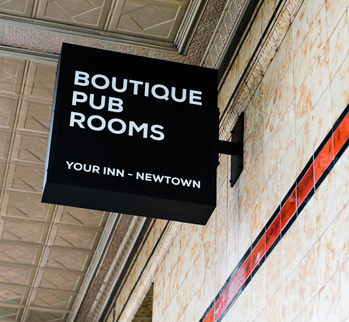 Together the pubs boast 35 accommodation rooms, and after a tasteful period-inspired renovation on the public bar and surrounds, the second stage of works at the Sydney Park Hotel sees unlocking of eight rooms, ranging from modest doubles to a huge king-size. Heritage complications at the 1891 pub had to be overcome, and access to the rooms is via stairs at the back of the public bar, opening to a classic pub common corridor. 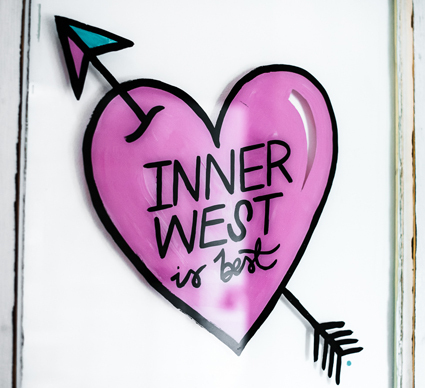 As well as the rooms, the corridor leads to fully restored traditional male and female bathroom amenities, featuring genuine fittings and tiles, and a communal dining area and well-equipped kitchen, with artwork by local artist Ginger Taylor adorning the walls. 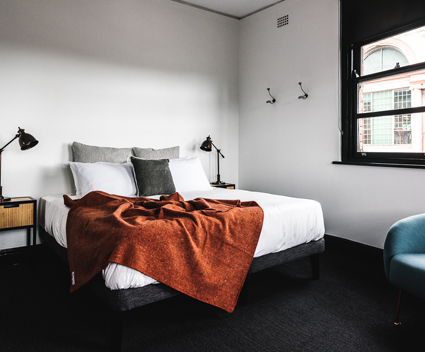 The rooms are themed in black, white and grey, but with selected flashes of colour, such as from the Tasmanian merino wool blankets draped on the beds. Some offer views of the landmark former brickworks smoke stacks at St Peters, some with their own original exposed brick walls. All are double-glazed to protect occupants from the noises of outside. The pub downstairs had no kitchen or food offering, so a previously private owner’s kitchen on the first level was expanded into a commercial kitchen, producing an Irish-kissed menu of lamb and Guinness stew, pork sausages and Wagyu brisket pie, and a roast on Sunday, under the guidance of former Henson staple, executive chef Meghan McCulloch. There are also the pub standards such as schnitzels and parmas, but in a nod to the precinct, these come in either chicken or eggplant. Stage three at Sydney Park will bring a multi-purpose rooftop space that may include a movie screen and pool tables, but no bar, due to proximity with adjacent apartments. Reilly reports a lot of behind-the-scenes work in the stable so far this year, now including a dedicated marketing and design employee who also manages the increasing number of accommodation bookings, now including SPH. As the final stage comes to fruition, Reilly has plans for the Cockatoo too, enhancing its family appeal via some development at the rear, and hopefully reinstating the balconies at the front. “It’s trading exceptionally well, but we want to bring it to the next level and until we get that DA through, it won’t be – we won’t have the facilities to get there.